The stereoscopy market today is moving heavily toward autostereoscopic glasses-free displays. Usually, the two views provided by ordinary stereo video are insufficient to show a 3D picture on these displays. Thus, if you’re performing 3D conversion and processing for digital signage or other applications, you need software that can create multiview video from stereo video. Stereo-to-multiview conversion methods require accurate depth maps for stereo pair frames, and YUVsoft is ready to meet that need with our Depth from Stereo technology. 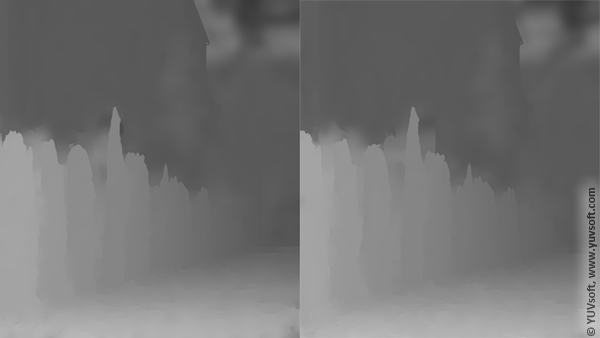 The YUVsoft Depth from Stereo plugin evaluates real shifts between the left and right views in a stereo pair to create a depth map, which is an explicit representation of the geometry of the input scene. Depth from Stereo generates depth information by analyzing the relative positions of objects and occlusion areas in your input sequence, enabling creation of high-quality stereo video. 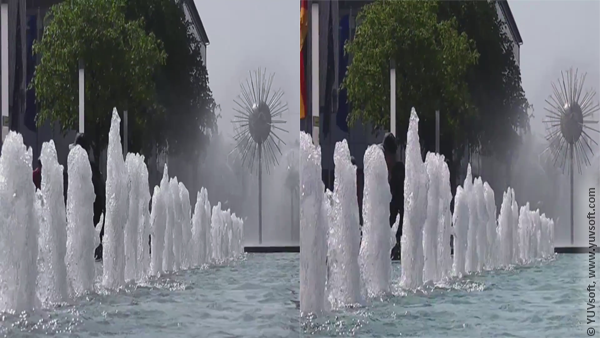 You can also use the resulting depth maps to change the parallax of the source stereo video and to perform depth grading. YUVsoft Depth from Stereo technology allows you to quickly generate accurate depth maps from your source stereo pair sequence. You can then use these maps to perform further stereo-to-multiview conversion, to change the parallax of your source video or to correct or process stereo video for use in a number of applications. Stereo-to-Multiview conversion technology – converts video from stereo pair format to autostereoscopic glasses-free display format. Stereo Correction technology – gives you the ability to fix vertical parallax and tilts between right and left views, and it also enables you to eliminate color mismatches in the input stereo pair.